If you wrote a post on this or any of my other discussion topics today, Friday, June 29th please leave your link in the Mr. Linky before midnight Central time (US) and you will be eligible to win a prize. I’m slightly biased, because I review for Audiofile Magazine, but I think they provide a really great audiobook resource. There is an actual, physical magazine that will introduce you to many audiobooks you might otherwise never have heard of. The magazine comes every other month, and a year’s subscription is under $20, or two years’ subscription costs less than $30. You can check out the reviews and some of the content for free online. When I’m considering getting an audiobook, I often go first to AudioFile to see what the reviewer there thought about it, to decide whether or not it is worth my time. Do you want to know what a bunch of bloggers think about an audiobook? Audiobook Jukebox is the place to find that out. You can add links to your reviews, and find links to other people’s reviews. A must-visit if you want to determine what the blogosphere’s consensus on an audiobook is. Another one where I’m biased! If you want the audiobook camaraderie of Audiobook Week all year ’round, check out my Sound Bytes meme, started after Audiobook Week last year. Every Friday I review an audiobook (or occasionally have other audiobook-related content). I encourage other bloggers to review their audiobooks on Friday as well, but I welcome links to any and all audiobook reviews/content from that given week. What are your favorite audiobook resources? I <3 Audiobook Jukebox too! I need to check out Audiofile Magazine. Audiobook Jukebox rocks! I’ve been on Audiofile online, but have never seen the magazine… I get most of my audiobooks from the library, and can get lost in the shelves for way longer than I’d like to admit. 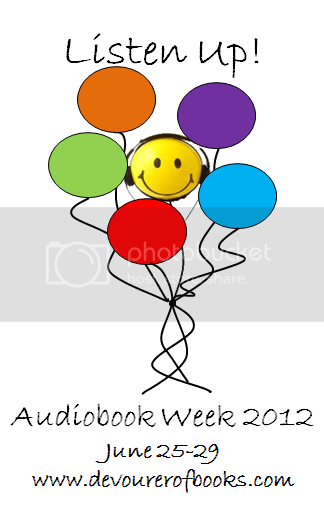 I have had such a great time participating in audiobook week and reading all the awesome posts! Thank you so much for hosting! I really need to subscribe to Audiofile Magazine! What fabulous resources! Thanks for sharing. I think the way I’ve picked in the past is to peruse what my library has available for download. Now I can go there with specific titles in mind! 1. I second the Audiofile Magazine recommendation. They also have two email subscriptions – one of reviews and one with mini-interviews and a new releases list. I just discovered your great resources. I will be participating in your Sound Bytes meme for my audio reviews. Thanks! Glad to learn about Audiofile Magazine! I’m not familiar with it but hope to find some good things. These days about two thirds of my reading (or more!) is listening and finding a great audiobook is essential. I usually rely on twitter recommendations but sometimes it can also feel that the same people are all listening to the same thing. Not a bad thing…just want more. What a great week! Great topics and I think I have a couple readers that are now either trying audio or will be soon!